I supported a wedding ceremony performed at the chapel in “Doshisha University” and a reception held at Saami ryoutei restaurant last weekend. The bride was my relative, “Sacchan”. I met her again here in Kyoto after 25years since our childhood. 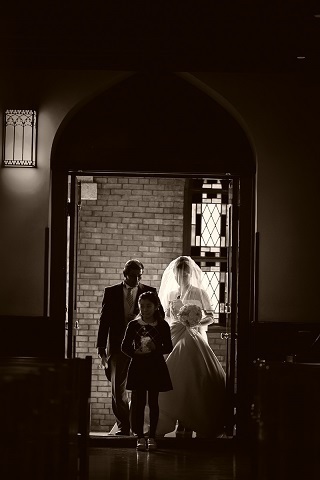 When I saw my uncle “Ikuo” and Sacchan entering the chapel with the music played by organ, I was on the verge of tears and had to wipe my eyes with my white gloves. 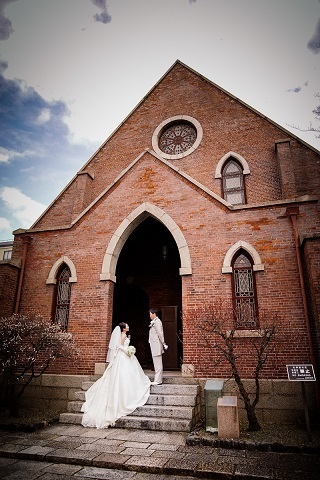 I am so grateful for the “Goen (=fate)” that brought us together to the oldest brick chapel in Japan. 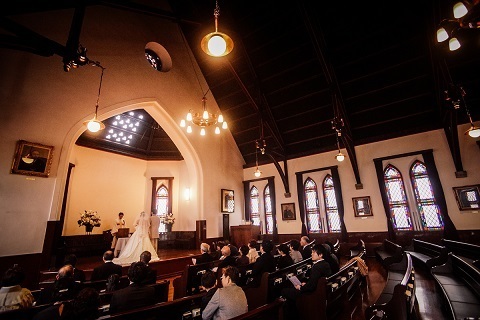 The groom, “Kazuki-san” graduated from Doshisha University, and he and Sacchan were attracted to this chapel as a venue for their wedding. That day was your very first step! I was so happy that I could be with you on such special day. Kazuki-san and Sacchan, I wish you all the happiness forever!